The elderly landlord who was allegedly beaten unconscious by his tenants recently, following rent arrears has been marked for death, THE STAR has learnt. The retiree told our news team that days following the incident, he awoke to find a dead pigeon placed at his doorstep accompanied with a powdery substance and a $10 coin. “Is some seance, cause dem seh mi children not here and dem want the house,” the senior citizen told THE STAR. At the same time, Bishop Joseph Ade-Gold of the Chambers of God International Church, after assessing the findings, concluded that the landlordhas been marked for deadly happenings. “Usually, a dead pigeon is used to send a message of death. Normally, we see pigeons as well respected and representing someone of honour,” Ade-Gold reasoned. He added that it meant, “We’ve lost respect for you and death will come to you.”Ade-Gold also hinted that the powdery substance and the coin were also strategically placed to entrench the witchcraft which someone intends to use to kill the landlord. “The pigeon is dead and they use the powder around the pigeon to bound the soul, and the money is used to mean there is a money problem between us,” he explained. Interestingly, he added that the use of the coin is a contemporary practice and is used to solidify the reason or reasons why the victim has been targeted. “In witchcraft, a reason is given because the witches cannot attack an individual without a reason,” Ade-Gold acknowledged. Ade-Gold also added that there are two methods of defence against such evil. “If the person is a Christian, they would have to use the blood of Jesus Christ, but if they are a sinner, they would have to seek help otherwise,” Ade-Gold explained. The landlord and two of his tenants have been at odds for months now as he claims they owe him rent amounting to $91,000, which is six months. Hi Arthur, how do you want me to help you? 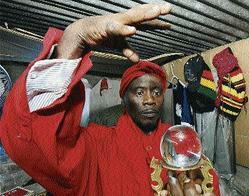 My advice is to get a divination first. Hi Tam, the black bird is a message and I get what the message is but I can’t say it here on the blog, if you can you can email me at [email protected] and I will try my best to explain. Tell your husband please do not kill it, it is a messenger and to kill it or attempt to kill it will bring problems to your door. I notice this black bird in the back of my yard about 2weeks NW every time it make a sound my 1yrs old son follow n make z sound.alot of pigeon is in the yard and him don’t copy them.is this black bird evil? My husband wants to kill it. Ade-Gold need fi pick a side…lol bishop seems verse in Non-Christian practices. But, hope one get ‘the blood of Christ’? ment: “how” one get the blood of Christ? can i get ur number obara? I’m good Obara. How about you? Oh so is just an intimidation thing then? Hi maniac how are you?…a lot of times when people sees these things, they mean nothing….ppl love to play up others fear….however it is possible that some malevont deed has been done and the evil person has place the pigeon or whatever item there to either warn the victim that, there is a war, or that they have touched them. The REAL spiritual worker do not do that, if someone has sent some evil force after you, you won’t SEE any sign, but rather you would feel the outcome!!! Can you explain exactly what these things do? Interestingly enough, some years ago while living with my child’s father, Iwoke up one morning to see a dead pigeon outside my bedroom window (didnt know what it meant but I knew it couldnt be anything good). There was no blood, and no sign that the dog brought it there as there were no feathers missing or anything. I went and told my parents who lived nearby, and my dad came and burned it after sprinkling some frankinscence (sp) and myrrh on it.